We stood in the sun, just gazing around at one of the most beautiful spots on the Mekong – the natural ‘bay' at Tha Suang, an hour by fast boat east of Pakbeng. 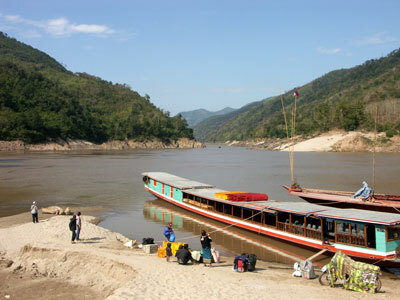 The vista of Mekong and hills stretched west, the river slowly rolled past local and hilltribe people using it as their main means of access to the outside world. In the deeper part of the ‘bay', a big boat was moored while it waited to be loaded with trees felled in the hills. We looked up, the sandy silt beach merging into the steep silt and dust climb to a tiny bamboo shade where boat tickets were sold and further on, hidden from view by trees, was the desperately poor village. A brief, tough struggle with bags and shoe-tugging silt got us to the top and there we found a 4WD pickup and its driver hoping to get someone to pay him for his return trip to Honsa. His luck was in and so was ours. We got in and he gunned his 4WD up the steepening track, through the village that looked poor by any standard, and on to the mountain road that led to Honsa. We thought it was a pretty rough road ... it felt like the worst road in the universe when we came back along it in a small truck ‘bus' that left us looking like piles of dust with eyes. But going in the 4WD, leaving the choking dust behind us, the ride was exhilarating and the views were beautiful. The first sight of Honsa was interesting rather than striking, the broad flat valley farmed and, in January, waiting for the new season. In some places, small plots were being worked to provide vegetables and in other places the first of the year's rice was being planted. But the morning was something else. 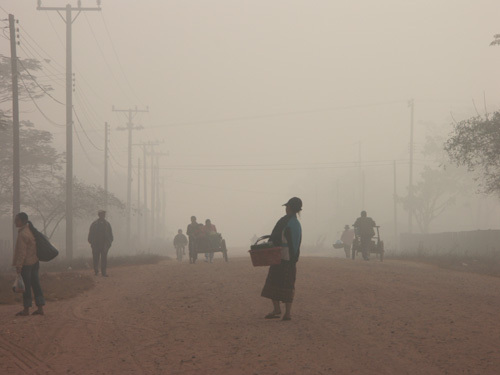 It was soon after dawn, cold and misty, and the people of Honsa were on the move (picture above). The market was in full swing, villagers looking through the 40 or more stalls selling vegetables, river moss, dried tobacco and fruit. Here and there, stalls were selling cooked meals and people were sitting round enjoying the food and the company. Further in were the places to avoid as traders offered the remains of animals and fish – and on the far side, the clothes and household ‘shops' were displaying their wares. Outside the market compound, a hundred Chinese motorcycles and a few Japanese bikes and 4WDs lined the dirt streets while their owners shopped and churned up the ever-present dust as they were driven away. Several monks walked past ... dozens of children went on their way to school ... and then, suddenly, there was a bang and a scream as a motorcycle hit a toddler as he ran into the road. A couple pulled the motorcycle off the child and carried him away; the rider stood, dazed, a sudden drama in the routine of morning. As he stood, the child's father ran over and hit him, then kicked him, hit him again and the driver squared up to his attacker as others crowded round. Friends and relatives took sides; a stand-off ensued but the child was being carried off by his parents – they had a long journey to the regional hospital where, hours later, he was pronounced to have a concussion. Honsa, in the first months of 2007, was at the crossroads of its history, of the history of its nation too. For, after centuries of remote but comfortable isolation, it found itself rushing into the 21st century with its timber and agriculture prosperity opening the way for vehicles causing dust clouds at busy times, television, mobile phones ... and, now, even its isolation was losing its power as a new border crossing with Thailand was putting it within two hours of tourist cavalcades (even if they did just pass straight through). And the ideas were changing too – the Thai businessmen were in town, a local had the idea of reviving the village's past and holding an elephant festival, everywhere there was building going on – the extra rooms at guesthouses, the civic buildings, the new temple. But for the visitor, it was still a fascinating look at an agricultural community – in fact, several, because the long valley supports a string of villages and, high in the mountains, the truly remote communities live and still earn their living with elephants pulling the hardwood trees being legally felled for the sophisticated furniture buyers of southern China and Thailand. It is odd what draws a traveller to a particular place. For us, it was the remoteness combined with the idea that it was an area of working elephants (so much so, said the guidebook, you could even buy elephant dung paper). We really wanted to see what they were doing and photograph them. But the promised elephant centre defied all inquiries and, finally fed up with our persistence, the guesthouse owners – the 4WD driver and his wife, who doubled as a local teacher – drove us to where the Lonely Planet said the centre was located. It was dislocated; or, put another way, not there any more. So we lashed out $50 for the 4WD and driver to take us high in the mountains where the elephants were working, dragging the logs 10 or 12 miles from where they are cut to the makeshift ‘village encampment' where trucks, amazingly, fight their way through to collect them (see link for longer description). Back down in Honsa, we quickly slipped into the routine of looking around and eating. There were many guesthouses but, curiously, there were few guests even at the peak season. Optimism runs high despite this and more rooms are being added. Some of the few guests there congregated at the Villa Sissouphanh where we were staying and we ate together, a thoroughly agreeable travel evening with great food and plenty of bottles of Beerlao. After three days, we reckoned we had seen enough and the next morning, despite dire warnings from the guesthouse people, we scorned the 4WD to experience life on the road with the locals ... or, put another way, we caught the first (and only) bus out to the Tha Suang landing place. It started well. We were at the back, with gave an open view for photography and a real risk of bouncing out – what's new about that? – as we bumped and swayed out way out of the village and started the long climb. Then the dust hit us. Thick, choking, red-brown dust that engulfed the truck whenever it slowed for a bend or bad road. As it got worse, we were silently urging the driver on, to keep up the breakneck pace that he sometimes managed, and not even the sheer mountainside drops of 500ft deterred our enthusiasm for speed. A soldier sitting opposite me had bright new camouflage fatigues on ... by halfway, I could not see the pattern or colour through the dust. And my new hilltribe jacket was equally covered – everyone, including June sitting next to me, covered their faces; one passenger threw up out of the open side; and others just looked like they were praying for it to end. And, finally, end it did. But not for 90 minutes. 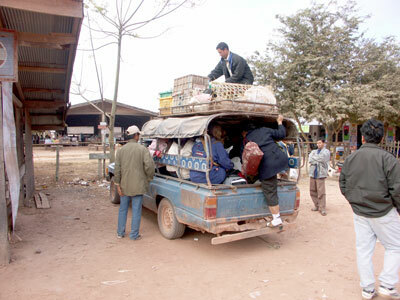 As we pulled into Tha Suang village, everyone staggered off, pounding their bags and clothes to free them from dust, and we started lugging our bags down to the landing stage. I eager photographed the scene but, even in a plastic bag, the dust was so thick on my camera that the photographs were useless. the warmth, drinking in the visual paradise (picture below) all around us. A couple of hours later, after a few false alarms, we could see a boat heading towards us. It was carrying Chinese motorcycles perhaps. Or oranges. A cargo boat of some kind and that was just fine. All around us, local people including a hilltribe family, waited with their possessions, including their ducks and their chickens for selling in Luang Prabang. One of the crew from the timber ship came over earlier and haggled a couple of chickens but they ignored us passengers as they sweated with their timber. As the boat neared, everyone crowded as close to the water as possible and, in the middle of them, we looked over their heads toards the incoming boat – and straight into a camera barrage. It was a tourist boat. And so crowded it seemed an impossibility that we could get on. But desperate situations mean desperate solutions, so we struggled on, some people helping, others complaining we were taking their valuable space.